he SMAI WKF Shin Instep have been manufactured to exact World Karate Federation specifications. We are engaged in offering Shinguards which are used for the protection of players. These are used to absorb or deflect the impact of the kick . We also offer Football Shinguard to our valued clients. These Shinguard are made by implementing latest technology to offer excellent product. The innovative designs of our Shinguard offer most comfort and high safety to the wearers. 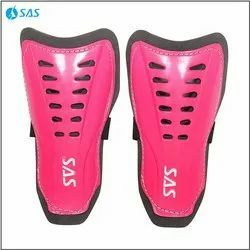 We offer wide range of Shin Guard Pad. Construction: Polyester cloth shielded plastic base with EVA rubber lining touching the body side for extra comfort and safety. Recommended Use: Ideal for clubs and school level player. - The Pro Shin pads with vented PVC shell, rear-fastening top straps provide a secure, adjustable and more comfortable fit. - Ideal product for beginners. - Heavy front plate with eva soft and cushion backing material. - Elastic Velcro tabs for closure. - Available in different color. - Available in Small & Large sizes.